This is a post I've been wanting to write for a long time. Before my sweet little HDawg was diagnosed with a dairy allergy, I had very little idea what the world of food allergies was all about. I, myself, have never had a food allergy. David has never had a food allergy. The only experience I have had with food allergies is that my best friend and my sister-in-law both have Celiac Disease. I have learned a lot from them about managing a food allergy and what that entails, but nothing prepares you for parenting a child with a food allergy. I have a lot of ideas and tips to share, but I'm going to save those for another post. Today, I thought I'd simply share our story. Our family's story about recognizing, diagnosing and managing H's food allergy. 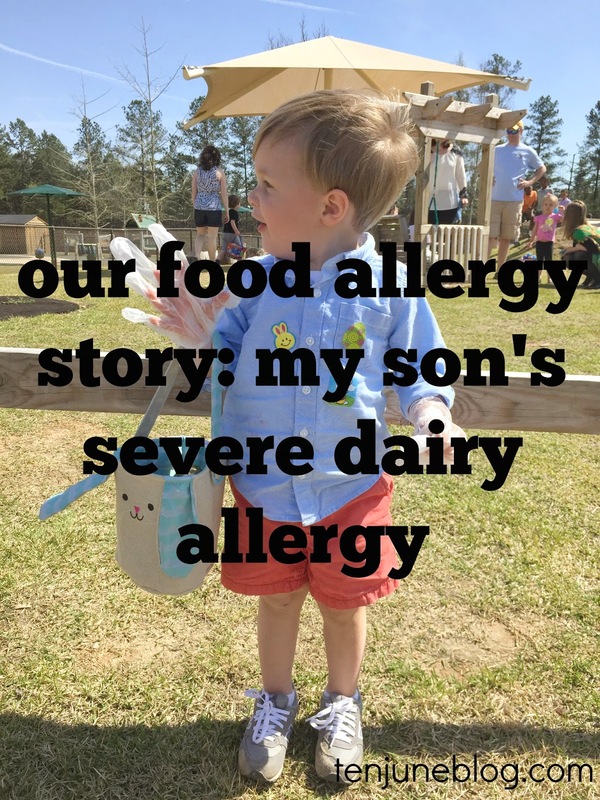 I hope that our story informs some of you, whether you're struggling with a food allergy, know someone who is or if you just want to hear more about it. I've found so much comfort in relating to those going through the same thing, so I want to be that for you! For those of you who haven't followed along for the past couple of years, I'll start from the beginning. My son H has a severe dairy allergy. Much like a peanut allergy, even mere superficial contact with dairy or a surface/person that has touched dairy can (and has) lead to anaphylaxis. Crazy rash, trouble breathing, EpiPen, the whole drill. After he was born and while I was nursing him, we noticed he was very fussy and had terrible reflux. He also had bad diaper rashes. Like any crazy new mom, I Googled away and found that, among other things, removing dairy from the mother's diet while breastfeeding could be helpful to alleviate these symptoms. And it worked, but of course, removing dairy from my diet couldn't be directly attributed to anything. Fast-forward to when he began to eat solids. At about 7 or 8 months old, we fed H his first cow's milk dairy product- a cup of probiotic yogurt (suggested by his pediatrician to help counter an antibiotic he was taking). Immediately, like within minutes, he began to welt up. He was covered from head to toe with a red, bumpy rash. We didn't know at the time if it was the antibiotic or the dairy, but we rushed him to the doctor's office and they monitored him, gave him some Benadryl and watched until the rash went away. They suggested that we try dairy in very limited form after about a month or two. So, at about 10 months old, we gave H a single piece of shredded cheese. Immediately, he welted up, a rash going around his mouth and up his face into his eyes. Yeah, pretty scary. We took him back to the pediatrician and they suggested we stay away from all dairy in HDawg's diet. It was kind of weird that they didn't send us to an allergist at that point (I'm sure they had no clue about the severity of his allergy), but they didn't. They just advised that we not feed him any dairy. So he drank soy milk, we didn't eat cheese. It was a pretty easy switch. For the next six months or so, we followed this really loose plan. Along the way, we began to realize that even the tiniest exposure of cow's milk would start his allergic reaction. We certainly weren't feeding him anything with cow's milk, but, say, if I fed him from a plate that also had a dairy product on it, he would react. Or if his food was cooked on a grill that had butter on it at one point, he would react. Or if a prepackaged item was processed in a facility with milk, he would react. So I decided enough was enough of the "laissez faire" attitude to his allergy and, guided by the advice of a new pediatrician, I took him to an allergist at about 1.5 years old. The allergist did a full panel allergy test and a full panel blood test. Sure enough, he reacted severely to cow's milk dairy. He also had slight reactions to eggs and lima beans, items he has since tested negative for. After the testing, we actually felt a little relieved. That sounds totally weird, but it was like our year-long suspicions about how badly dairy affected him had been confirmed and we were now on track with a clear path and plan in hand: an official diagnosis and a doctor who would help us manage the allergy. The allergy doctor prescribed an EpiPen "just in case, even though I'm sure you'll never have to use it." Unfortunately, he was wrong. We took him back to the allergist the next day. He did a full panel test for the pecans and other nuts- no reaction. We retested him for a multitude of items to see if he had new allergies. No issues. We also did an in-house taste test analysis where H ate pecans in front of the doctor. No reaction. It wasn't the pecans. It wasn't many other items that we tested based on what he ate. The only explanation is that H's dairy allergy had gotten so severe that someone at the party unknowingly touched dairy and then touched H without washing their hands. Insane, right? I looked at the doctor- that could lead him into anaphylactic shock? Seriously? The doctor nodded and said, unfortunately it looks that way. He compared it to those people who have a severe peanut allergy. My son? Crazy. Since that moment in time, we have taken all dairy out of our house for fear of any cross-contamination. Our little girl, who is now almost 15 months old, only drinks cow's milk at school. We drink almond milk at home (no more soy milk, that's another story), eat coconut ice cream and make cashew cheese. And we love it, honestly. Going dairy-free is actually a choice I prefer now. Minus that moment in time I want some good queso. Then I miss me some cheese. Otherwise, being dairy-free is totally manageable. And I feel such a sense of relief knowing we aren't unintentionally exposing HDawg to any scary contributors. Speaking of our Little Lady June, we decided to be proactive with her and any potential food allergies. While there's no indication that a dairy allergy is hereditary, we wanted to be safe. At 12 months, we ran a full panel test on her and she had negative results. No dairy allergy. Such a relief. The best part? My kid is so dang brave about it all. I seriously have anxiety attacks when it comes to things like kids birthday parties (cheese pizza! cake! ice cream! milk cartons! dairy everywhere!) and H? He just takes it with a grain of salt and is proud to tell everyone he's different, that he's got a food allergy. That picture above? That's him at his school Easter egg hunt. The school filled the eggs up with chocolate and cheese goldfish (I know, very frustrating) so instead of opting to sit him out, we asked him to wear gloves. Of course, we had to watch him closely so he didn't open the eggs up, but this prevented any issues in terms of accidentally touching what was inside each egg. He was such a trooper, he loved it. If there's one thing I've learned in all of this it's that this boy is not afraid to be different, that he's cool to rock what he is. He's my role model. Well, that was a long post. Like I said, I plan to do another post with some basic tips and tricks for any food allergy parent. Until then, I'd love to hear your questions or if there's any other aspect of being a food allergy parent that you'd like to know about. Leave your thoughts in the comments or shoot me an email- tenjuneblog@gmail.com. Until then, feel free to check out some of my dairy-free recipes. Please note that I'm not a medical expert. I'm just a mom. A mom of a kid with a food allergy. I'm just sharing my story and our experiences and certainly not trying to render any medical advice! Honestly, I had no clue either! This is all new territory to me, too. It's definitely awesome to keep in mind allergy kids when it comes to classroom events. So many brands out there these days are free of the top 8 allergens (nuts, gluten, dairy, etc. )- fruit pouches, Enjoy Life brand which has cookies and even candy bars (sold at my local Kroger! ), Dum Dum lollipops, Welch's Fruit Snacks... there are a lot of options. Thanks for sharing! We are going through something similar with our son. Not quite as severe but we know he is allergic to something (welts everywhere) but we can't figure out what exactly. He turns 1 next week so they will finally test him (woo hoo!). Wish us luck! Have you ever considered going to someone who does acupressure or accupuncture? My neighbor became allergic to corn. They use corn in all pain meds, etc when giving birth. So she had to do acupressure instead of accupuncture and they cured her corn allergy. I'd give it a try - it may do nothing, it may reduce the allergy or even cure it. I hope it tames a little as he grows. My cousin used to be allergic to peanuts and isn't any longer as a teenager, but still won't eat anything with peanuts. His body almost knows when peanuts are in something. Great post Michelle. A severe food allergy is nothing to mess around with. I see it all the time teaching my littles at Bible study. While many/most have gone peanut free (the most common) there are so many others to consider. As you know, both my youngest and I became aware of our food allergies a couple years ago. We had no idea our child was allergic to wheat as it manifested itself in migraine headaches days after consumption!!! She too has a caesin allergy. We always thought it was a lactose intolerance. And soy...glad you decided NOT to continue with that. I have heard some crazy stories regarding those who drank primarily soy (particularly females). I do have a question though. I know you said Little Lady June only drinks cows milk at school. Do you worry she might still have residue (for lack of a better work) on her hands or mouth when she comes home. I know little love to love on each other. This post struck a chord with me! My son has a severe peanut/tree nut allergy, and like you, neither of us (his parents) have food allergies. I almost feel the dairy allergy is a more challenging allergy because it's not as well known and goodness, dairy is in everything! Thank-you for sharing your story. I felt/feel the same anxiety when it comes to social settings, but I am getting better over the years. And my son is 7 now, and has always been very good about asking if something has nuts. We have learned to carefully read labels. His last reaction was, before he started school, to a pack of gummy worms (we think). We later found out they were packed in a facility that processed nuts. Same reaction---hives from head to toe--on a road trip, nontheless. I was full on panicked, ready to call 911. I literally thank God that he survived, because I called his pediatrician's nurses line and they said to give him Benadryl, I think because he wasn't having any trouble breathing. But later when I talked to his allergist, he was in complete disagreement. Said he should have had the EpiPen. Thankfully we haven't had any encounters since then. When he started school we asked about a 504 Plan, which you can google, but it basically is a standardized plan that the schools can put into place for students with severe food allergies. Thankfully his school already had one in place. I would like to know how you deal with lunchtime at school. This past school year, my son sat at a nut-free table that had one other student and was allowed to select one classmate on Friday to join him. He often complained the other nut-free student was on silent-lunch punishment and he didn't have anyone to talk to. So, I don't feel we have a come up with a plan that my son is totally happy with. Thanks again, and I look forward to hearing what you have to say about this! Holy moly, mama. I just want to express how amazing I think it is that y'all were/are vigilant & proactive about his allergy. I was dairy-free while breastfeeding & Quinn still has a sensitivity to cow's milk but that's just small potatoes!! It's only a tiny fraction of what you all encounter daily. And it melts my heart that HDawg is going with the flow, even embracing it with his cool as a cucumber attitude.